Tolstoy's literary heirs talk about what they would do in their final hours. 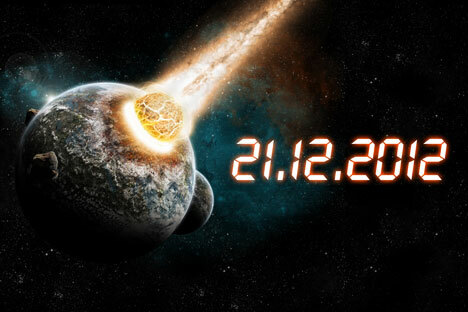 The editors at Russia & India Report pretty much agree the world will not end on Friday, December 21. But still, the End of Days disciples have given everyone pause. Are we living our lives fully? How do we really want to spend the time we have left, whether it is two days, twenty years, or more? What would you do if you found the world was coming to a sudden and savage end, after all? The following are the answers we received from Tolstoy’s literary heirs. If nothing else, the end-of-days discussion may help with procrastination. Enjoy! German Sadulaev’s first novel, “I am a Chechen” has been translated into English. The Grozny native, a highly entertaining speaker who attended “Read Russia” at the New York Book Fair in June, agreed to speak to RIR about the end of the world. “I’m not quite sure about the mass end of the world on the 21st or any other day. It seems to me that this "end of the world" mess will stay here for a long time. Each of us is waiting for our own personal "end of the world." Therefore, each of us will need our own ‘Personal Jesus.’ By the way, this song is not by Depeche Mode, but a cover of old dog Johnny Cash's song,” Sadulaev said. "I would probably catch up on some sleep,” said the St. Petersburg (then Leningrad) native, who moved to New York with his family when he was a teen. “I'm sure the end of the world will be very noisy, so I'd like to get some rest before the fun starts," the droll writer said. Sergei Shargunov represents Russia’s new wave of young writers. The 32-year-old novelist and poet of six books won the Debut prize in 2001 and his new work, “The Book without Photos,” made the shortlist of the prestigious National Bestseller prize last year. When asked how he would spend his last days, Shargunov said, “I’ll try to answer philosophically. Like Sadulaev, Shargunov managed to talk intimately about the end of the world—or the end of the world for each of us. “I think that if the end of the world suddenly occurred, I'd act according to the principle ‘be what you’re supposed to be and do what you are supposed to do.’ I'd go on playing with my kid and have fun, and go on writing my novel without thinking it is the last,” he said. “It's worth remembering Pushkin's 'A Feast in Time of Plague' - that's not only exposure of heartlessness, but also a tribute to the holiday celebration despite everything,” Bykov added. Bykov said that if he knew the end of days was coming soon, he’d try to spend as much time as possible with family. Prilepin wasn't sure he has an exsact plan of activieties: "I don't know what would I do, probable I won't do something special, just live my usual life, tried to live further." Xenia Grubstein, Olga Ivanova and Nora FitzGerald contributed to this report.